Sheera (Sooji halwa) | My Cooking Diaries "CooklikeCecilia.com"
Traditionally Sheera or Kesari Sheera is made with equal quantities of rawa (semolina), ghee and sugar. I have many a time been tempted to try this version but have not found the courage to make it yet (using that amount of ghee!). 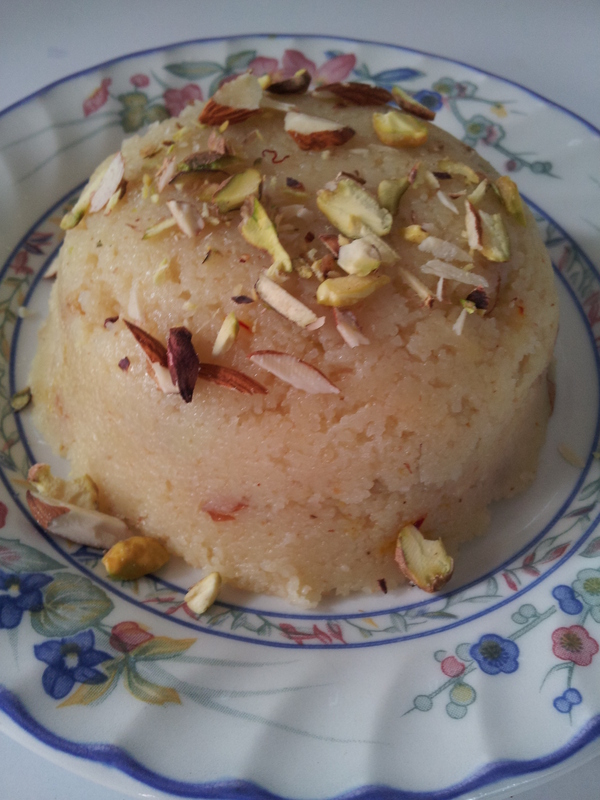 Traditional sheera is usually made on auspicious occasions and served at temples and homes as ‘prasad’ on poojas. Slice the almonds and pistas and clean the raisins, removing stems if any. Heat ghee in a kadai and fry the raisins till they swell. Remove and set aside. Fry the nuts lightly and remove or fry alongwith the rawa, reserving some for garnish. Add the rawa to the kadai and fry on medium low flame till it turns light brown and you get a nice aroma. Takes about 15 to 20 minutes. You can fry it longer if you prefer it nice and brown. Do not fry on high flame or the rawa will get burnt ruining the sheera. Add the hot water and stir quickly to avoid lumps being formed. Then add the nuts (reserve some for garnish) and raisins. Keep stirring till it begins to leave the sides of the kadai and forms a ball. Put into bowls and press lightly and turn out onto a serving plate. Garnish with nuts and serve hot.